Justin K. Franklin, age 28, of Lakemoor passed away on November 20, 2018 in Elk Grove Village surrounded by his loving family. Justin was born on May 7, 1990 in McHenry the son of Karen and the late Kenneth Franklin. 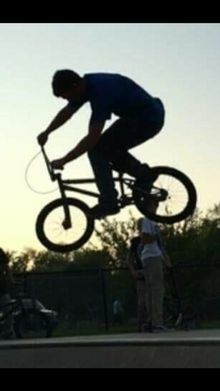 Justin's biggest passion in life was BMX Biking. It gave him a sense of serenity, freedom, and pure utter joy! Throughout the years the Extreme bond Justin shared deeply with the biking community can only be summed up with one word, "Brotherhood." The vastness of Justin's heart was filled with compassion intertwined with unconditional love for his family and friends. He had the ability to empathize along with the willingness to extend his heart and helping hand to console anyone in need. Justin's warm smile, witty sense of humor and charismatic personality captured the hearts of all. Justin, my son "You will Forever be my Heart." He is survived by his mother Karen; his siblings: Kenneth S. Franklin and Amber D. Franklin; his niece and nephew Kamron J. and Karina A.; his maternal grandparents Garnett (Nancy) Creger; his aunts and uncles Bonnie Schipp, Donna Mrowka, Rhonda (John) Evans, Douglas (Mary) Creger and Christine (Kevin) MacDougall; his cousins Shawn (Lisa) Schipp, Renee (Rick) Strauss, Jeremy Evans, Rachel (Nate) Rusticus, Joshua (Meghan) Schipp, Wesley (Teagan) Mrowka, Sarah Schipp, Katie Creger, Chantelle Mrowka, Elijah (Olivia) MacDougall, Charissa Mrowka, Eiley MacDougall as well as his beloved cat, Jynx. Justin was preceded in death by his father Kenneth; his paternal grandparents Jerry and Romilda Franklin; his uncles Paul Schipp and Frank Mrowka. Visitation will take place on Saturday, December 1, 2018, from 2pm to 6pm. Interment will be private. In lieu of flowers memorial donations may be directed to the family. I will miss your boyishly handsome smile, quick, sarcastic wit and the laughs that we shared. You have made a huge impact on those around you during your life. Rest easy, Justin. Hope you're enjoying biking in heaven. I will always remember you and the impact you made on my life.